According to the NGF, the National Golf Foundation, an organization which develops the growth and vitality of the game and business of golf, an estimated one in every four Americans, aged six years old and over, which is about eighty-two million people, consume some form of golf media. The massive reach extends far beyond the 24 million active golfers. This includes an abundant and diverse group that’s attractive to media companies, marketers and advertisers. Golf provides lifelong recreational opportunities and enjoyment for millions and is a major U.S. industry. It generates jobs, commerce, economic development and tax revenues for local communities. 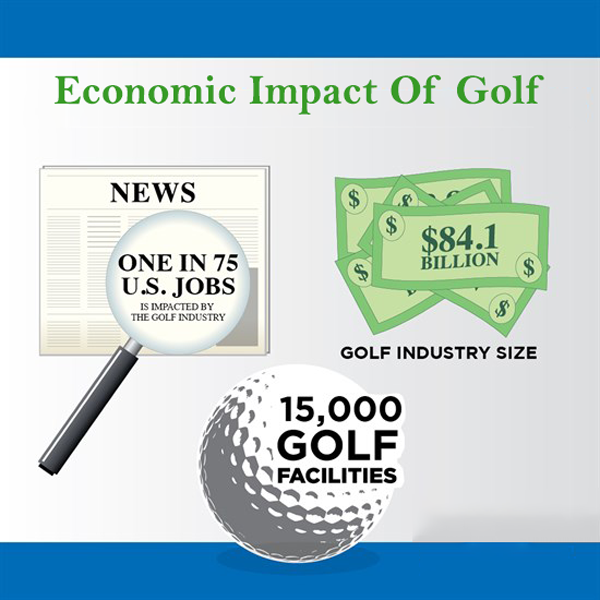 The economic impact of golf is conducted every five years. The latest U.S. golf economy report established the total impact of the golf industry to be an estimated $84.1 billion. Golf is big business, which directly generates no less than $84.1 billion in economic activity across the U.S. The findings reflect a 22% increase from $68.8 billion in 2011, the last time the U.S. Golf Economy Report was released. Additionally, golf also supports an estimated two million jobs and about $59 billion in compensation. The biggest economic driver for golf was, of course, golf course operations. Approximately 15,000 golf club facilities in the U.S. generate an estimated $33 billion in operational revenue annually. This is money generated from green fees, membership fees and range fees, golf cart rentals and the nineteenth hole. Operational revenue was up almost 12% from $29.8 billion in 2011, a noteworthy turnaround after the financial crisis that ended in 2010. Tourism was the industry's second-biggest contributor, like golf, which drove about $26 billion in revenue. That too is up, from $20.6 billion in 2011. New golf home construction, which closely tracks national trends, also soared to $7.2 billion after dropping to $3.1 billion eight years ago. On-course and off-course sales of golf equipment, apparel and media were $6 billion in 2016, with the strongest sales growth in the equipment category. Professional tournament spending, associations, and golfer endorsements also serged to about $2.4 billion while charitable fundraising racked in an estimated $3.94 billion.